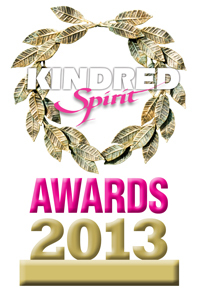 Kindred Spirit Magazine is looking for nominations for the Kindred Spirit Awards 2013 and is asking people to vote for their favourite spiritual writers, artists, thinkers, therapists and others in the community. The award website says: "There will be six prizes given out by the Editors at an awards ceremony at the end of May 2013, followed by a private reception where readers can mingle and chat with nominees, winners and the Kindred Spirit team. Nominations are open ... until 31 March 2013." In the writing category, you can nominate book authors but can also nominate journalists, bloggers, tweeters or anyone who spreads the mind, body, spirit word. Which means I'd be eligible for a nomination if you like reading my blog. If you choose to vote for me, my full name is Lucya Starza and I'm the author of A Bad Witch's Blog at www.badwitch.co.uk. I've included a few links to some of my own favourite past blog posts at the bottom of the page, if you want to remind yourself of what I've written. You can nominate people for the awards quickly and easily here: http://www.kindredspirit.co.uk/ksawards. Everyone who fills in the online form will also be entered into a prize draw to win some great books by Hay House, so it is worthwhile doing so.